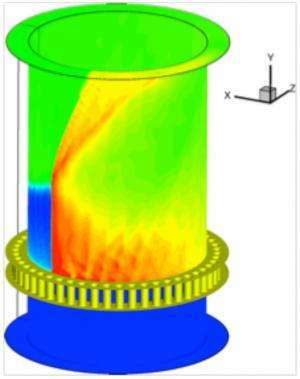 NRL researchers have constructed a model of a Rotating Detonation Engine. (Phys.org)—With its strong dependence on gas-turbine engines for propulsion, the U.S. Navy is always looking for ways to improve the fuel consumption of these engines. At the Naval Research Laboratory (NRL), scientists are studying the complex physics of Rotating Detonation Engines (RDEs) which offer the potential for high dollar savings by way of reduced fuel consumption in gas-turbine engines, explains Dr. Kazhikathra Kailasanath, who heads NRL's Laboratories for Computational Physics and Fluid Dynamics. Many Navy aircraft use gas-turbine engines for propulsion, with the Navy's gas-turbine engines being fundamentally similar to engines used in commercial airplanes. 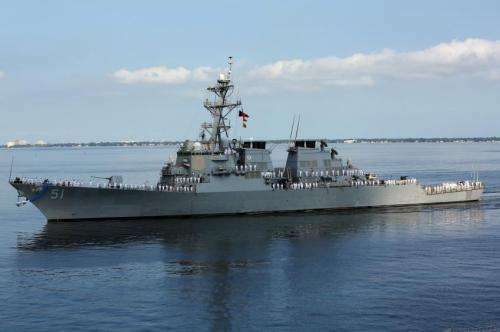 The Navy also depends on gas-turbine engines to provide propulsion and electricity for many of its ships. Even as future ships move toward the model of an "all electric" propulsion system, they will still need gas-turbine engines to produce electricity for the propulsion system and other critical systems. So building a gas-turbine engine that can handle the Navy's requirements for its warfighting ships and provide a fuel-efficient engine is a high priority for researchers. NRL researchers believe that RDEs have the potential to meet 10% increased power requirements as well as 25% reduction in fuel use for future Navy applications. Currently there are about 430 gas turbine engines on 129 U.S. Navy ships. These engines burn approximately 2 billion dollars worth of fuel each year. By retrofitting these engines with the rotating detonation technology, researchers estimate that the Navy could save approximately 300 to 400 million dollars a year. Like PDEs, RDEs have the potential to be a disruptive technology that can significantly alter the fuel efficiency of ships and planes; however, there are several challenges that must be overcome before the benefits are realized, explains Dr. Kailasanath. NRL scientists are now focusing their current research efforts on getting a better understanding of how the RDE works and the type of performance that can be actually realized in practice. While seeing an incremental improvement over conventional turbines, PDE / RDEs are still compromised insofar as they're dynamic impeller systems, as opposed to positive displacement systems (such as the internal combustion engine). This limits their peak efficieny to a narrow range of usually high speeds. ICEs on the other hand are more or less equally inefficient across their output range, thus able to run semi-efficiently at slower speeds that would be impractical for a turbine. A positive displacemnt turbine would thus be a more desirable mechanism. I looked into this and found that, just as the RDE implements a 'constant pulse' version of the PDE cycle, a single-stroke internal combustion engine is mechanically viable, wherein compression, combustion and expansion all occur constantly in parallel, as per a turbine, with the difference that no gasses can pass through the engine with the rotor locked, unlike a turbine - hence rendering a 'positive displacement turbine' cycle. The key is to extend the cylinder into a closed loop, with separate, interlinked loops for compression, combustion and expansion. Thus such a motor would comprise three hoop-shaped sections, which could be nested or stacked, with each hoop composed of two contra-rotating halves, one side bearing the pistons, the other side constituting the cylinder. However on closer look the first stage, compression hoop, cannot follow this design - positive displacement compression with one moving part going in one direction doesn't appear to be mechanically possible. However one then realises that PD compression isn't strictly necessary - the real benefits of positive displacement come during the combustion and expansion phases. Thus we can use dynamic impeller compression - perhaps multi-staged if necessary (for instance the Periflow design) - while retaining all the advantages of positive displacement for the rest of the cycle.